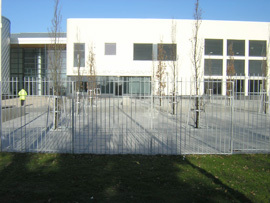 We can offer a wide range of security boundary fencing and gates (Swing/Canti-lever) for vehicle and pedestrian access. With new types of fencing being designed all of the time security can be achieved with out making your premises looking like a fortress. Steel palisade, railings security and ornamental, weld mesh fencing, weld mesh panels, multi wire weld mesh systems, razor wire, barbed wire, rotating taps, chain link, site hoardings, and sports fencing. Ball Court fencing (rebound boards, kick boards, heavy duty mesh at lower level), tennis court fencing, sports netting (golf ranges, ball stop). Barriers for protection for pedestrians and property, hand rails, bollards, buffer barrier. All galvanized metal products can be colour coated to match your requirements.